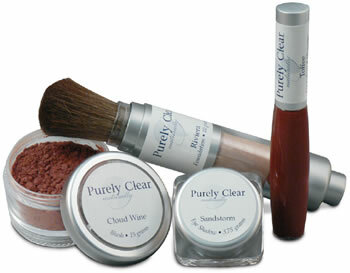 Purely Clear Mineral Makeup line is unique in two primary aspects - what it does contain and what it does not. Dimethicone: A silicone oil and a component in silly putty, caulks, adhesives and aquarium sealants. It is an eye irritant and can exacerbate allergic conditions. A two year study revealed uterine endometrial tumors in female rats subjected to dimethicone. Carnaba Wax: used in car waxes, shoe and furniture polishes. It is used as a thickener in cosmetics. Purely Clear contains a blend of frankincense, resveratrol and green tea extract in all our foundations, eye shadows, blushes and bronzers to provide antioxidant and anti-inflammatory benefits for the skin and body. Numerous studies have shown multiple health benefits of oral and topical use of green tea. Prevention and treatment of cancer, heart disease, Alzheimers and other degenerative neurological diseases, diabetes, viral and bacterial infections are just a few of the researched benefits involving green tea use. It has been noted to potentially prevent skin tumors and photo damage from ultraviolet light. Resveratrol is a natural compound found in the skins of certain red fruits, seeds, grapes, berries and red wine and other various herbs. Recent research has revealed numerous anti-aging and health promoting benefits with its use. Specifically, studies have shown it promotes cardiovascular health, has multiple anti-cancer benefits, normalizes and enhances endocrine health and increases life span and prevents premature aging. Frankincense has been used as a resin and oil throughout recorded history for numerous health promoting and spiritual purposes. It was one of the more valued and prized substances in the world for centuries and was one of the gifts brought to Jesus by the Wise Men. It has been shown to be helpful with respiratory infections, urinary health, calming effects on the emotions, and has antiseptic benefits. It aids in collagen production of the skin and is shown to be a powerful tonic for the skin. It also is said to prevent and reduce wrinkles.